I really need to start taking pictures when I do this, but I never know how it’s going to turn out when I start! 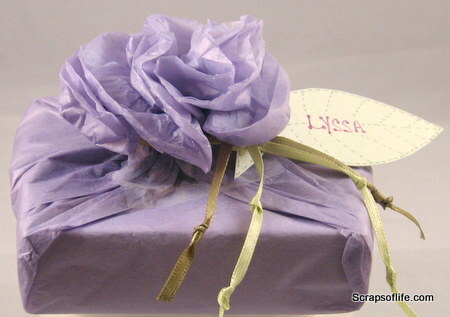 I started by wrapping the box in a long piece of tissue paper several times. Just rolled it up like a piece of candy with plenty of extra paper on each end. Then I pulled both of the ends up and towards the center, pinching it together a bit. It was at this point that I realized the upturned ends of the paper kinda looked like petals, so I grabbed some clear tape and secured the center, then fluffed the “petals” a little, crunching those that were longer, and separating the layers to give the impression of lots and lots of petals. While that was pretty good on it’s own, it needed a little something, so I took two lengths of green ribbon and tied them around the base of the flower. 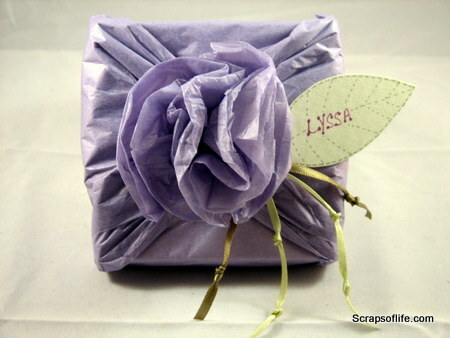 Then I hand-cut and decorated a tag in the shape of a leaf, attached it with the ribbons, and knotted the hanging ribbon ends to make it look pretty. And to open the gift? 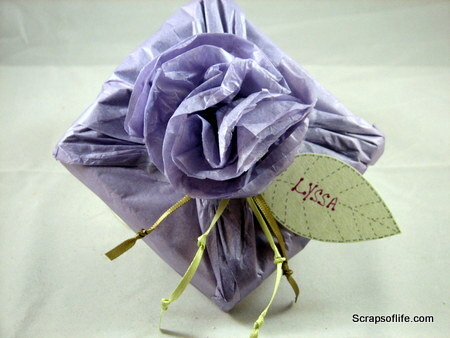 It’s tissue paper so it’s very easy to tear through the back of the paper, slip out the box, and leave the pretty flower intact! The next week I decided on a spur-of-the-moment gift for another friend–our DM at the DDE sessions on Wednesday night and our season was coming to an end–but it, again, equated to a boring square. 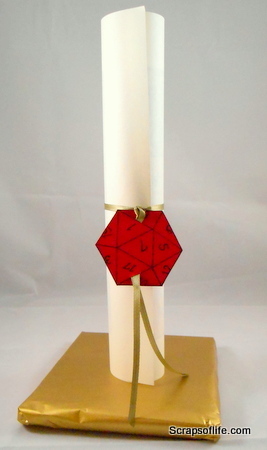 I just stuck with a straightforward wrapping job on the gift in gold tissue paper, and turned the card into a scroll for kicks. To make the tag, I drew and cut out a d20 (20-sided die) of red cardstock, and cut two small slits at the top and bottom to slip the tails of the ribbon through, then added the “to” and “from” to the back of the tag. Hint: With this sort of decorative closure, it helps to tie the ribbon in a loop, first, then roll the scroll a little smaller, slip it through, and let it unfurl to fill the space. Otherwise you’re just juggling a bunch paper and ribbon and you might as well be trying to dress an octopus in a onesie. Can you do a tutorial on this? I’d really like to try it!